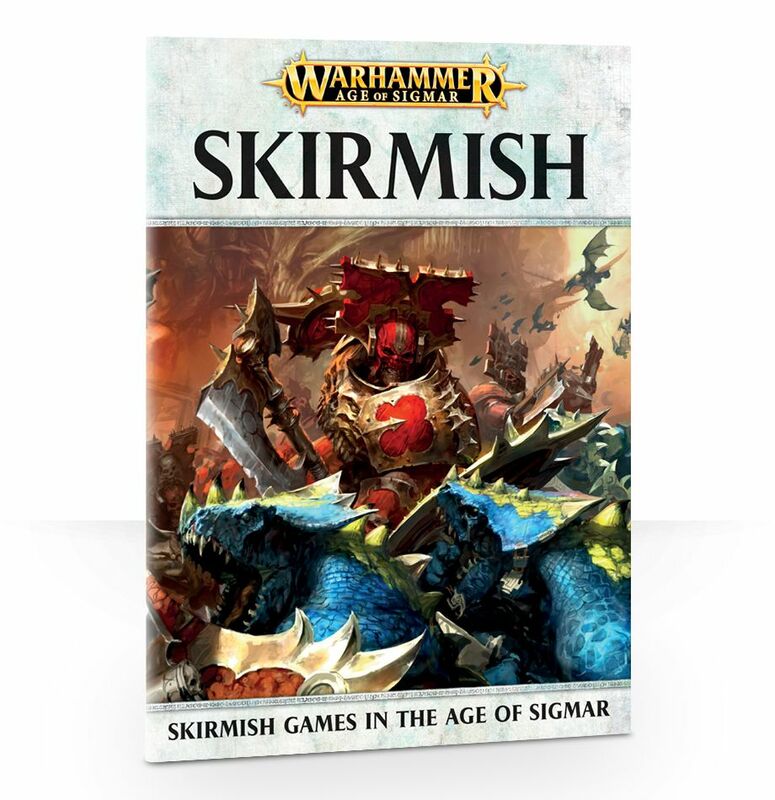 Almost a year ago, in June 2017, Games Workshop has released an expansion for skirmish games, a band-oriented approach to playing Age of Sigmar, with just a handful of models. This scaling preserves the simplicity of Age of Sigmar's original framework and breaks the games playtime down to 30 to 60 minutes. The rules of AoS Skirmish aim at building small, thematic warbands. 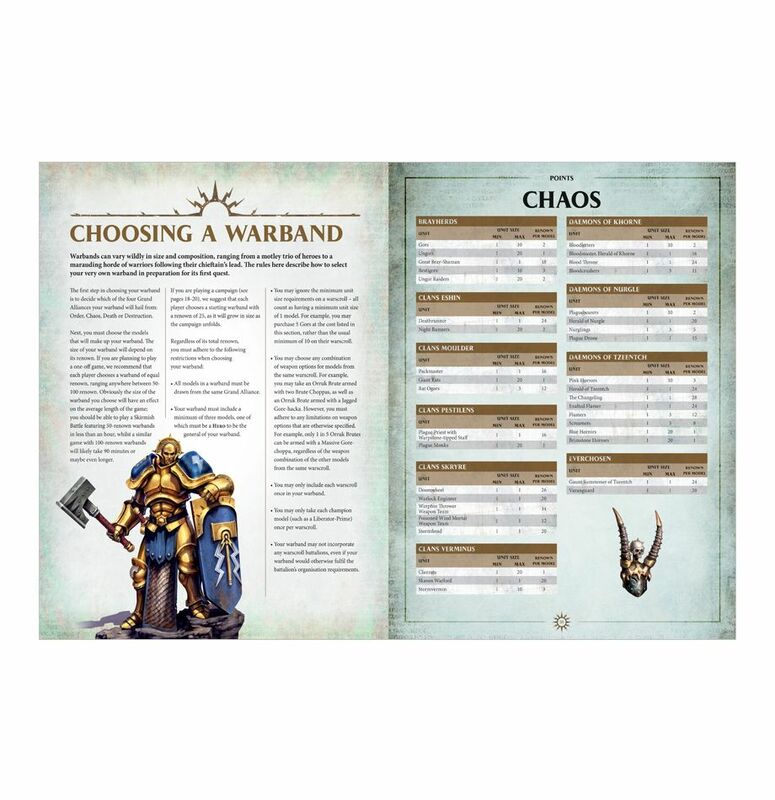 Choosing your warband is limited only within the grand alliance, not within a specific battletome. The size of the warbands is estimated throughout a points value called "renown" and is usually between 25 and 100 renown large. From there on, the game takes on a size that is already sufficient for regular Age of Sigmar games. The gangs clash in different scenarios, half of which are designed for a balanced game, while the other half contains a certain imbalance. All six scenarios can be played as a linked sequential campaign. 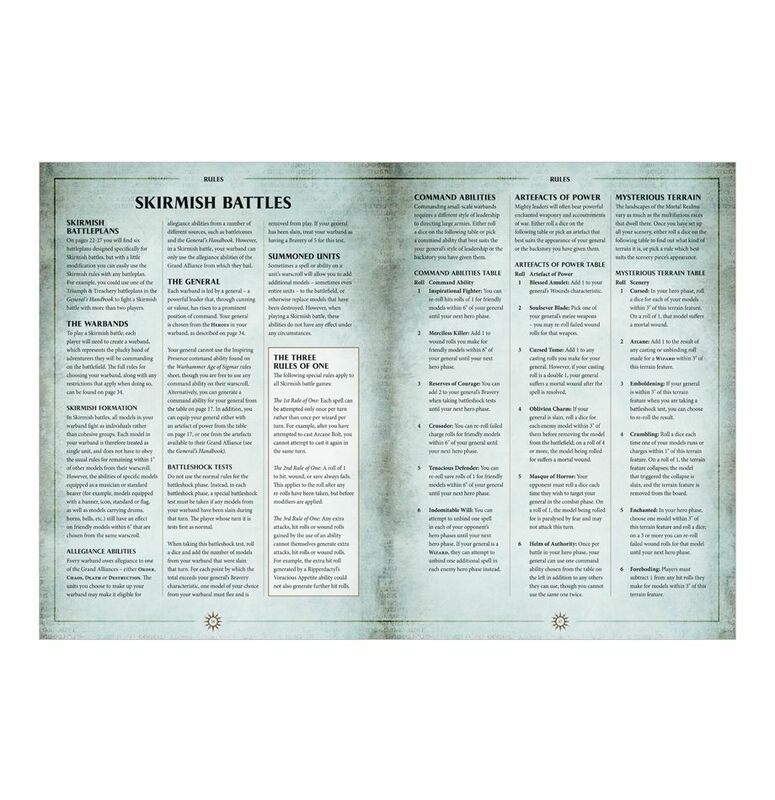 The background section briefly summarizes the history of the setting and describes a special event around the destroyed city of Shadespire. Yes, the same Shadespire that is mentioned in Warhammer Underworlds. Three of the six scenarios are suitable for quick games in between, as they are fairly balanced. There are also a few minor adjustments to the basic rules, which concern the abilities of heroes and prevent a given faction from receiving too many benefits. Also typical for a skirmish system is that each model is treated as a single unit, but possible bonuses affect all models of the same Warscroll. The last part of the book lists the selectable units of the big alliances. Not all models of the range available a year ago are listed. This has probably been done in favor of balance ... but that's just a guess, as it's also noticeable that on the part of the miniatures side it's only the ones available in plastic. How is Age of Sigmar Skirmish played? Since the game almost completely uses the rules of the basic game, players who already had contact with AoS will find their way quickly. However, the rules for magic and heroic abilities have been adjusted due to their strength. The wizards, in particular, have been significantly weakened by limiting the spells to a general selection for all factions. The heroes' abilities though are not affected. 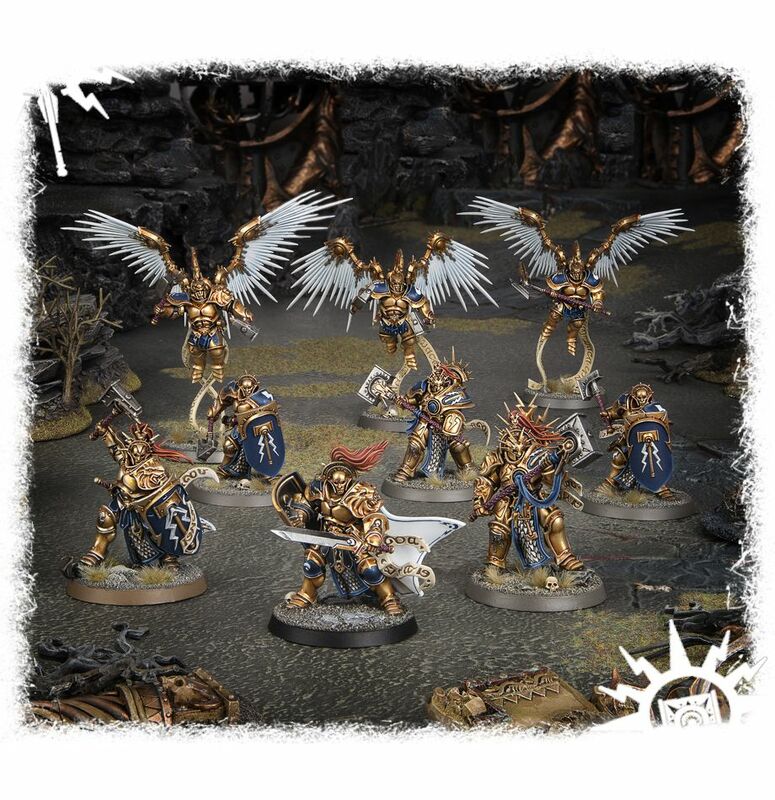 However, a general selection of abilities and items for them is also present and helps especially those armies whose rules are older or have not yet been ported to the current Warhammer setting. The three scenarios "Collision at dawn", "Treasure hunt" and "Get the relic" are most appropriate for balanced games. In "Collision at dawn" it's just a matter of taking more than half of the opposing warband out, which can be quite tricky, as the placement of your units is determined randomly and must remain clear at least nine inches around the center of the field. "Treasure hunt" also provides a powerful random element as the potential treasures are hidden at five different points on the map. Since the game is limited to five rounds, the first discovery of a treasure generates an unprecedented speed and pressure for both players, since at least one of the players is always forced to act. The same goes for "Get the relic," where the participating warbands have to reach a point in one corner of the field and have to hold it with more models than the opponent. Further pressure is created by decreasing the safe area of the field from round to round. Models outside this range suffer D3 mortal wounds. 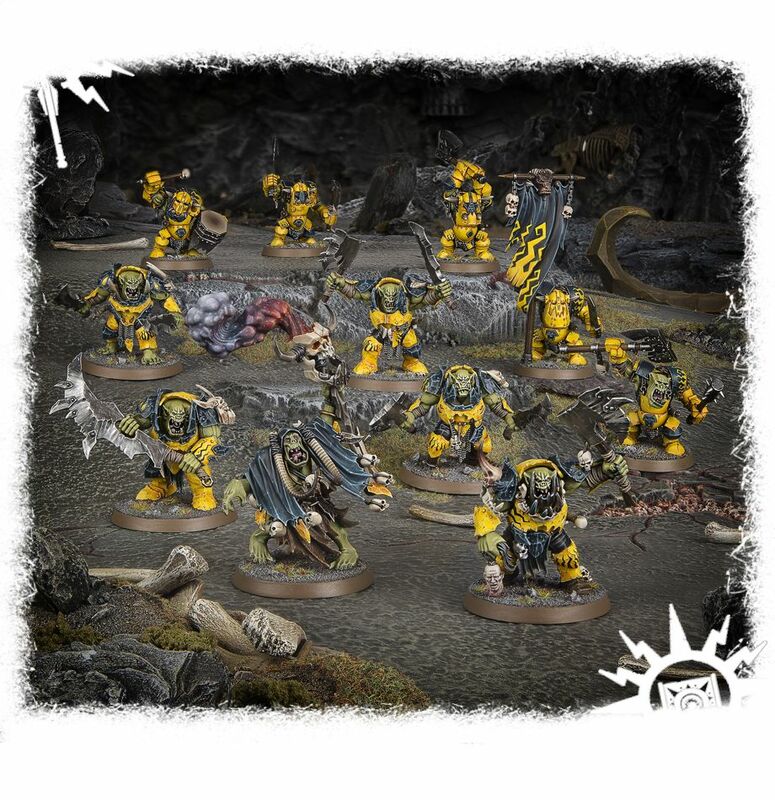 Since the release of the skirmish expansion, Games Workshop has released some warband boxes, such as the Ironjawz Weirdnob Warband or the Stormcast Eternals Hammerstrike Brotherhood. All warbands have a renown value of about 80 renown and complement each other well with existing Getting Started boxes. Otherwise, it has recently become a bit quite in the skirmish department, which is not least connected with the appearance of numerous new boxed game sets. 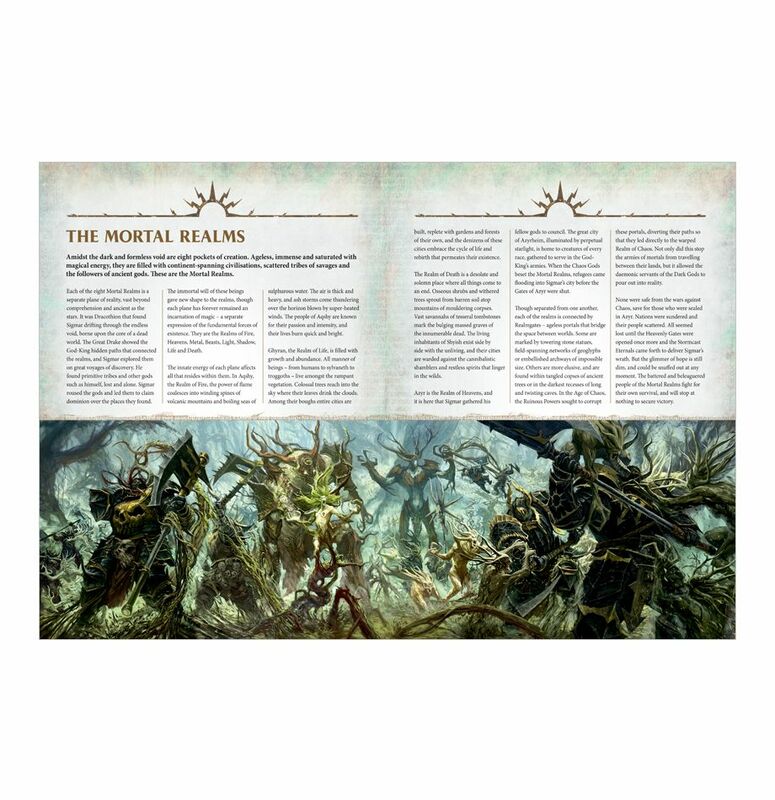 At this point it would be a nice touch of customer service, if Games Workshop would provide a free downloadable PDF extension supplement the missing factions, or to complete the existing ones. In any case, the community has already gotten around here and the document "Full Points List" can be found on the forum tga.community, which adds renown values fort the missing models. For just eight euros (8 EUR) you get more than you see at first glance on the 40 pages of the skirmish expansion. People like me, who are already count as old geezers in the hobby and due to family and work have rather little time to play, are getting a compact game that can be played well and fast with a few miniatures already. In my test games I got the impression that the renown value up to 50 points almost represents the equivalent of the game time in minutes. Also, you need only a little material per se. At this point I even recommend not exceeding a score of 30 fame and keeping it across multiple scenarios. Following this simple limitation will generate very atmospheric warbands and it will be worth the time and effort you invest in painting the models and/or terrain. People who like playing campaigns will get their money's worth as well here. Although the scenarios all play in Shadespire, they can effortlessly be used as framework scenarios that allow you to make up your own story. This way it is also possible to slowly build a foundation for small Age of Sigmar games, or get the first units ready for a "Path to Glory" campaign. A special icing on the cake is that most Warhammer Underworlds: Shadespire bands are already playable in "Skirmish" with their constellation, or combine well with another Shadespire faction to form a larger band. Once I've managed to persuade Bunker boss Dennis to a mini-campaign, I will also introduce some possible band combinations.